Acknowledged by the Wyalusing Area School Board for a year of cross country excellence on Monday evening were (above, from left) coaches Jim School and Ellen Coates and runners Travis Bahl, Alex Patton, Catherine Brown, Kemuel Laudermilch, Kevin Heeman, Caleb Stoddard, Logan Newton and (not pictured) Christian McClelland and Daravin Curlee. In their Nov. 12 public meeting, the Wyalusing Area School Board agreed to hire a new junior high school coach, reviewed the value of the dual enrollment program, congratulated state-qualifying cross country runners, approved a maintenance contract for the HVAC systems on the campus, and agreed to pull some funds from the district’s capital reserve to bring the HVAC system up to date. The computer that controls the heating system at the high school is more than 10 years old and was not upgraded when the new elementary school was built. Board members see the purchase of four control driver engines at a cost of $15,290 and a MetaSys Communication System at $14,204 as a long-term investment that should save the district money and bring more consistency to a system that has been challenging to maintain. Additionally, the district has forged a $10,299 annual agreement with Johnson Controls for once-monthly maintenance visits. Maintenance supervisor Bob Brigham has been working with company technicians and expressed confidence that they will detect the need for belts, filters and other routine upkeep that should prevent most major issues. 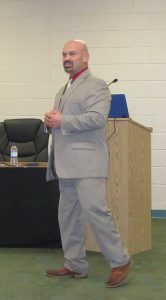 Superintendent Jason Bottiglieri noted that the cost per hour under the proactive contract is much lower than the reactive “on-call” fees. Eight cross country runners and their coaches were congratulate by the school board, each receiving a certificate from Bottiglieri. Coach Jim Schools credited the advancements of seven boys and one girl to states, as well as the girls team’s 11-1 record for the season to their “winning mindset,” adding “It’s a testament to the quality of people that they are.” The season will also be remembered for a lot a mud, Schools joked. There was but one course in New York state that was not a soggy mess. High school principal Gary Otis provided an overview of how the dual-enrollment program is shaping the plans of college-bound students with virtually no additional effort on their part. Thirty-five students are currently participating in the program, earning advance credits with either Keystone College or Lackawanna College. At present, the students are taking advantage of just 13 of 111 courses offered, which is the most ever, according to Otis (below). The savings on tuition is considerable, Otis explained. At the current pace of enrollment, Wyalusing students will save more than $160,000 when comparing the average $100 per credit earned in high school to $520 per credit via traditional college enrollment. And students who apply themselves can earn as many as 59 advance credits, enter college at the sophomore level and graduate early. Another program that is providing a means for students to get ahead of the game is PC-Now at the Northern Tier Career Center in North Towanda that allows students to earn credits that can be applied upon enrollment to the Pennsylvania College of Technology. Schools was brought back to the podium to provide insight to a lengthy discussion as to whether or not the district should hire a new coach specifically for the junior high track and field program, which began three years ago. Approximately 30 students plan to participate in the spring, and Schools has been managing both the junior and senior high programs. In addition to sometimes feeling that he is spreading himself thin, he suggested that the student athletes deserve a dedicated coach. At the request of the board, Schools had contacted other districts and determined that most of them with similar participation rates have at least one dedicated coach for junior high. Bottiglieri related that the salary of $1,612 is already in the budget as per the district’s collective bargaining agreement. Board member Barb Prevost noted that when the junior high track and field program was started three years ago, the district’s budget was in dire straits and such a discussion would not even have been entertained. It was a bit of a relief, she continued, to able to make a decision based instead on what is best for the students. “It’s a matter of safety,” Prevost concluded, giving her nod to the proposal. The decision of the board to advertise for a new coach was unanimous. Gifted teacher Melissa Bennet brought a number of students to the podium who had recently participated in a field trip to the WNEP Channel 16 studios in Avoca. 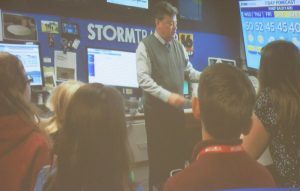 The visit was part of their careers exploration curriculum which was focused that month on broadcast journalism. Bennet said that the students were impressed by number of people who work behind the scenes and are never seen on camera. She also credited the WNEP staff for being very accommodating of their young guests and explaining their various roles to the students. Those present with Bennet took their turns at the microphone, sharing their favorite parts of the field trip, which mostly centered around helping meteorologist Kurt Aaron (above) with a live Backyard Weather segment. The board approved a number of proposals to ensure that the district remains compliant with its requirements to provide psychology services to students. 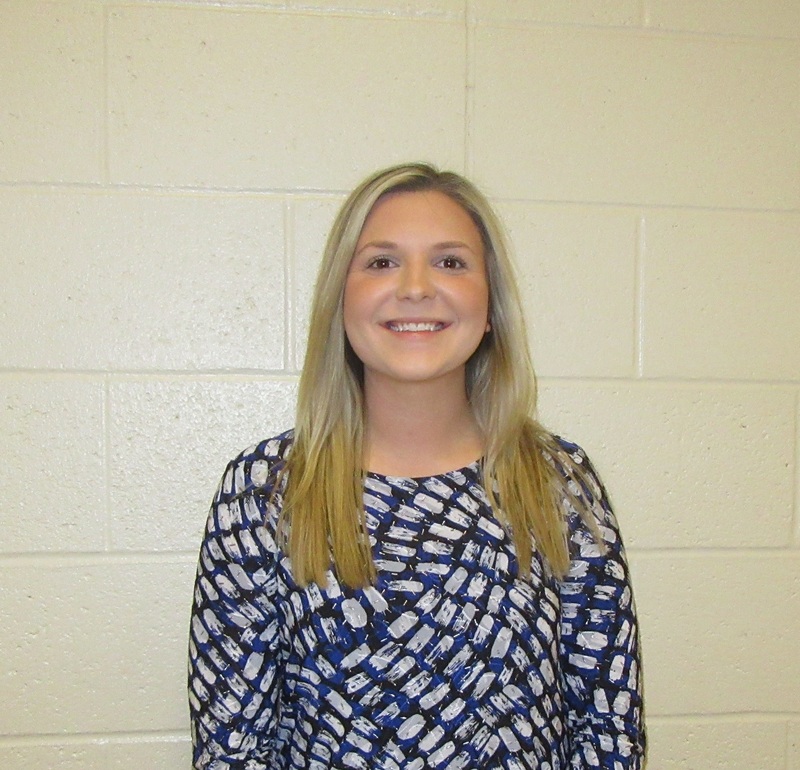 Kristi Naylor (below) was approved as the district’s new psychologist, but she will not be able to assume the position until May 2019, after she has completed her certification program. 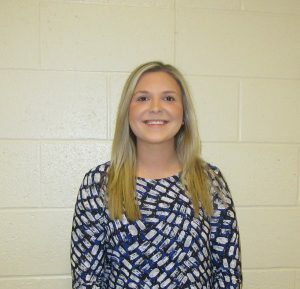 In the interim, Samantha Woodward will provide services as needed, as will Apple Tree Associates. 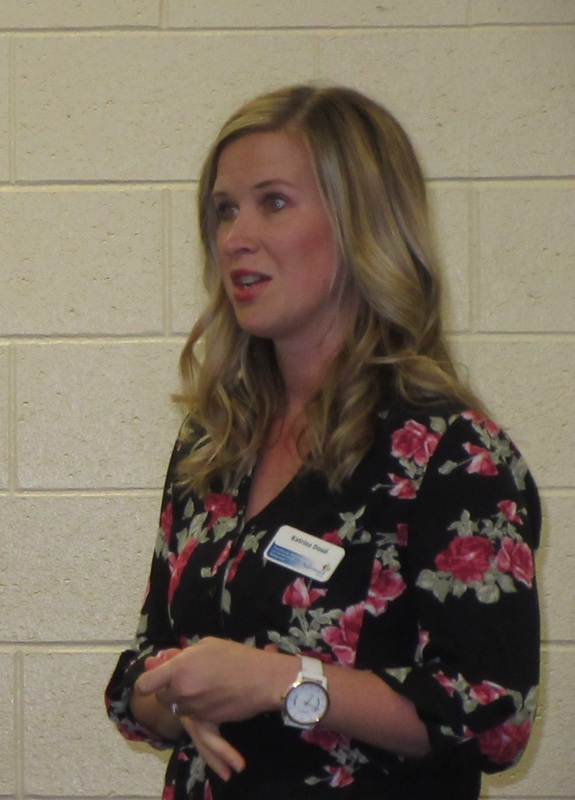 Nutrition Group regional manager Katrina Doud made her annual appearance before the board. In addition to noting that sales of school lunches were up, Doud introduced the new NutriSlice phone app, which allows parents to see at a glance the nutritional content of food being served at the schools, as well as calorie and carb counts. Food services director Nancy Iseminger was credited by board members for both the increase in food sales and the managing a happy cafeteria staff. Doud (below) credited Iseminger for her creativity in keeping lunches exciting with Nutrition Group’s Food Fusion initiative, which looks to the food truck approach of offering unique combinations. Iseminger noted that her debut of the macaroni and cheese and pulled pork waffle was well-received by the students. Additional technology upgrades are coming to the schools before year’s end to make use of federal E-Rate funding while it is available. Improvements will include a five-fold increase in internet speed and full WiFi capability at the high school by Christmas, according to Bottiglieri. In closing, board member Doug Eberlin complimented the school administrators on their handling of the recent death of Wyalusing teacher and coach Jim Huffman. “You all stepped up and did a great job. Thank You,” said Eberlin.